Lights Out 8 is live on MMTV! Today is the first full day of qualifying. Stevie Fast Jackson leads Radial vs the World after two rounds of qualifying with a 3.79 run. 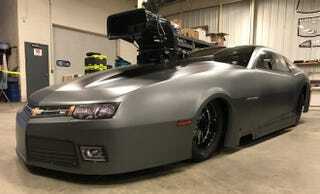 (Daddy) Dave Comstock is on the property with Goliath 2.0, and he is the top qualifier in Outlaw Drag Radial. I have to admit that I may have shed a few tears when I saw the ODR qualifier sheet this morning. Dave leads the field, but Mustang Mike was listed at #1 with a time of 3.99. RIP, Mustang Mike. Eliminations start tomorrow at 6 PM EST, then resume on Sunday at around 10 AM EST.